Young children with an Autism Spectrum Disorder(ASD) can vary greatly in their level of understanding due to their developmental delay. A young child with ASD may seem to progress in a typical way, while others will take a longer time to reach levels of understanding that will keep them safe within community environments. As a result of their own behaviours, or the result of not perceiving or understanding unsafe circumstances, young children with ASD are vulnerable to safety risks in the community. Every child with ASD needs to be treated as an individual and therefore this will mean that some children will be perfectly okay in their participation in community activities, while others will require their parents to model safe behaviours and work closely with them to achieve these. A perfect example of this using play equipment safely eg. 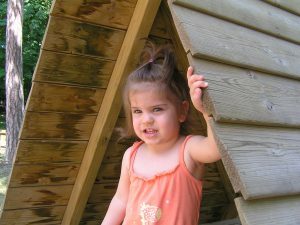 accessing a slide, one child may know to wait for the previous child to finish and get off while another may just go down the slide resulting in kicking the previous child in the back. Due to the developmental delay experienced by young children with ASD, they may not understand the idea of consequences for their behaviour in the community. This can possibly create a greater safety risk as they may be unaware of activities or situations that could be more dangerous than others. As the parent of a young child with ASD you will be acutely aware of the abilities of your child and therefore you will be able to plan ahead for any eventuality when out in the community eg, when going to the park for a play date with others, is there a secure fenced area or is there a lake that your child will be attracted to? There are many things to consider and our checklist for community access is a great place to start. Getting your young child out and about in the community is a great way to develop many skills. For instance, parks provide opportunities to develop motor skills by using play equipment and having the space to run. Community swimming pools also allow for the development of personal skills by using the change rooms for dressing, showering, going to the toilet. This helps your child to see that they can use other environments to use these skills and they are not exclusive to home. The more experiences you can provide your child within the community, the more likely it will be that they develop the many skills required to keep them safe and to be an active participant in their community in the future years.